A group of UA faculty members traveled to Greece in May as part of the Alabama Greece Initiative. 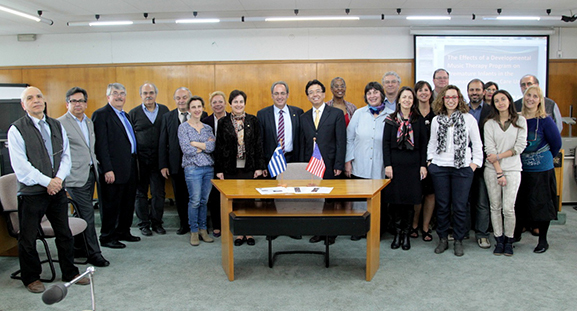 From the June 2014 Desktop News | When someone is truly confused by something, they might say “It’s all Greek to me,” but The University of Alabama Greece Initiative is just the opposite; it’s all about furthering understanding and collaboration between UA and Aristotle University of Thessaloniki, Greece. A group of faculty members from the University recently traveled to Greece to meet with representatives from Aristotle University to discuss potential projects on which faculty from both entities could cooperate. UA’s delegation was headed by Dr. Luoheng Han, senior associate dean for the College of Arts and Sciences. Six College of Arts and Sciences faculty members were selected to partner with faculty from Aristotle University to explore possible collaborations on research projects with a worldwide scope. They spent a day together on May 10 exchanging information and ideas. That conference was attended by Aristotle University Rector Professor Yannis Myopolous and Robert Sanders, general consul of the United States in Greece. Aristotle University is a public university in Greece’s second largest city, Thessaloniki. It is the largest university in Greece and in the Balkans with an enrollment of 81,000 students. Dr. Juan Lopez-Bautista, professor in the Department of Biological Sciences, conducts research on biodiversity, evolution and assembling the tree of life of algae. He was paired with Professor Maria Moustaka and Lecturer Spyros Gkelis. Dr. Ibrahim Cemen, professor in the Department of Geological Sciences, offered a proposal to establish an ongoing collaboration with Aristotle University’s Professor Spyros Pavlides in order to further study the prediction of earthquakes. Cemen’s research interests include earthquake potential in western Anatolia. Dr. Andrea Cevasco, associate professor in the School of Music, offered a proposal to compare the current status of music therapy in the United States and Greece to better understand advances and practical applications being made in both countries. Cevasco was paired with Lecturer Dora Psaltopoulou. Andy Fitch, associate professor in the Department of Theatre and Dance, offered a proposal to explore similarities and differences among staging and scenic designs in Greek and U.S. theater, with a view toward collaborating on set designs. His collaborator is Professor Lila Karakosta. Dr. Trudier Harris, professor in the Department of English, suggested that Greek sources for naming in the African American community is well known, as is Greek interest in African American writers. Her project examines the interactions between Greek and African American cultures. Harris was paired with Associate Professor Youli Theodosiadou. Dr. Tatiana Tsakiropoulou-Summers, associate professor in the Department of Modern Languages and Classics, proposes to study why the view of women as inferior emerged in classical Athens at the time of democracy’s birth. Her collaborator is Associate Professor Katerina Kitsi-Mitakou. University of Alberta doctoral candidate Vaia Touna, an Aristotle University graduate and Thessaloniki native, joined the trip as Dr. Han’s assistant. “Our hope is that these collaborative projects will produce new and groundbreaking research, as well as play a role in furthering the understanding and relationships between Greek and U.S. cultures,” Olin said.